seeked those that currently hold much higher number of such short positions than one year ago. Marshall Wace stands-out as the hedge fund with the most big shorts in our records, and also with considerably higher number of disclosed shorts than one year ago (170 vs 140 shorts). Besides Marshall Wace, and among those with at least 50 currently disclosed shorts, only GLG Partners (63 vs 36 shorts) and Merian Global (54 vs 32 shorts) have more significant shorts than one year ago. Short selling activities by Marshall Wace are rather well distributed among a number of EU countries. 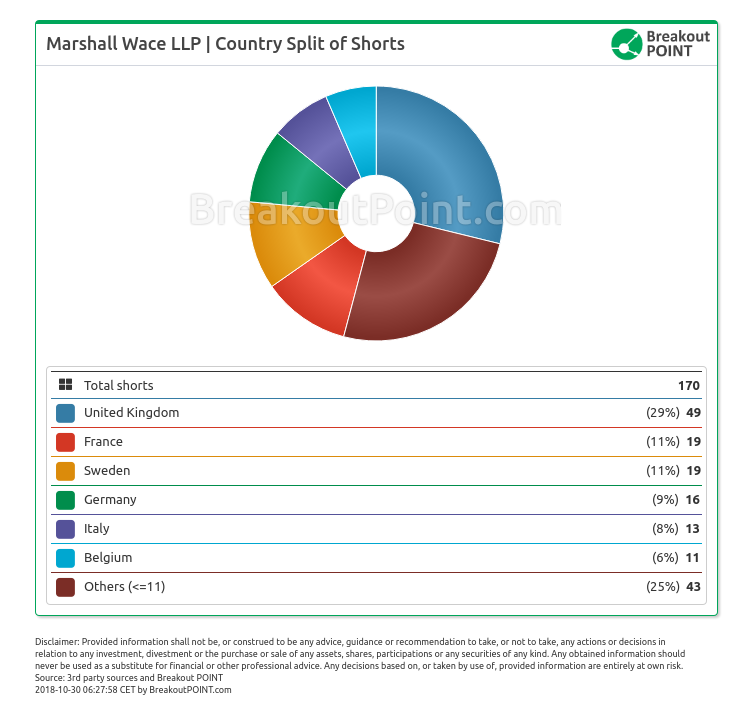 About 30% of Marshall Wace's disclosed shorts are in UK, while in each: France, Sweden, Germany and Italy, are about 10% of their big shorts. 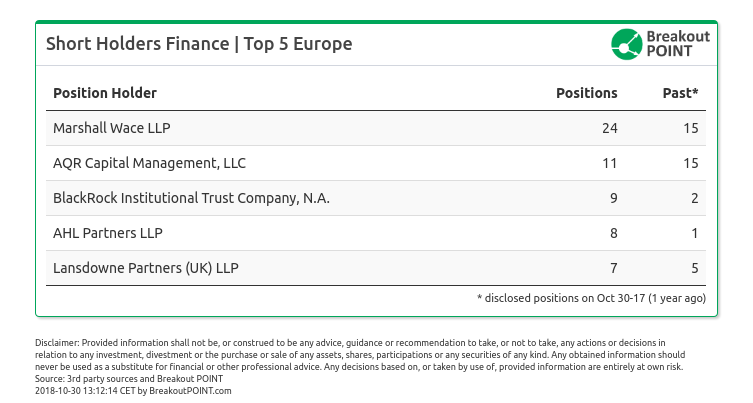 On the other hand, disclosed short positions of GLG Partners and Merian Global are much more UK centric. About 80% (GLG) and 60% (Merian) of their disclosed shorts are UK shorts. 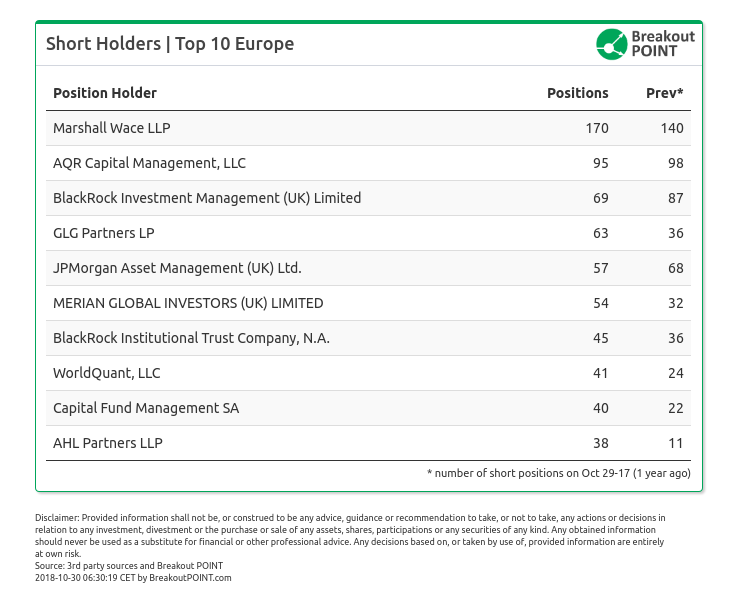 Marshall Wace also holds, by far, the highest number of significant short positions in EU's financial sector. They hold 24 such shorts, while second on the list is AQR with 11 disclosed short positions. In terms of % of issued share capital, two biggest financial shorts of Marshall Wace are in Italian banks. As of latest disclosed values, these are: a 4.27% short in Banco BPM and a 1.93% short in Unione di Banche Italiane. How about Ray Dalio's Bridgewater? In Q1-2018, Ray Dalio's Bridgewater disclosed more than 50 EU short positions (in Italy, Spain, Germany, France, Netherlands, UK,...), receiving a lot of media attention. For example, only in Germany 14 such shorts appeared. However, the last of these short positions were cut under 0.5% of issued share capital in July and, according to our records, Bridgewater holds no significant European shorts since then.